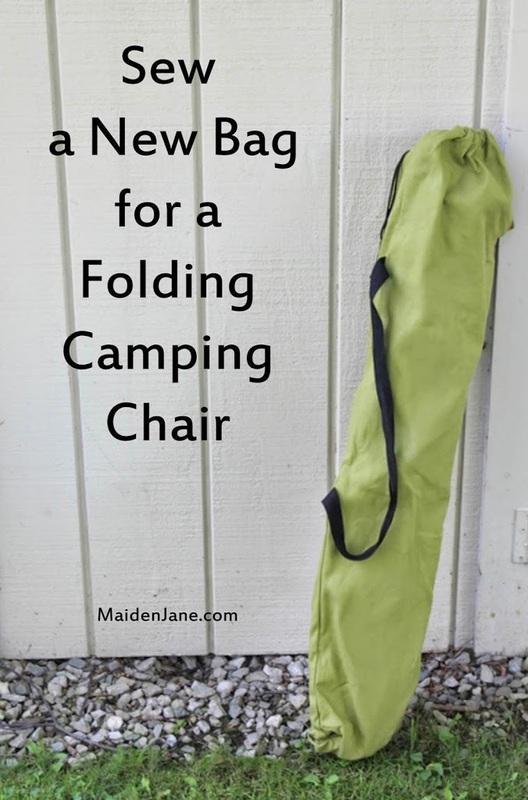 Do you need a new bag for your folding camping chair? Is yours made out of nylon and falling apart at the seams? I’m embarrassed to show you my bags, but here is one. We use our chairs for picnics, baseball games and the beach. It did not take long for the nylon bags to rip. If you look at the bag below, my husband (ingeniously) turned the bag upside down so that the ripped side is the new opening and the drawstring side is the bottom. 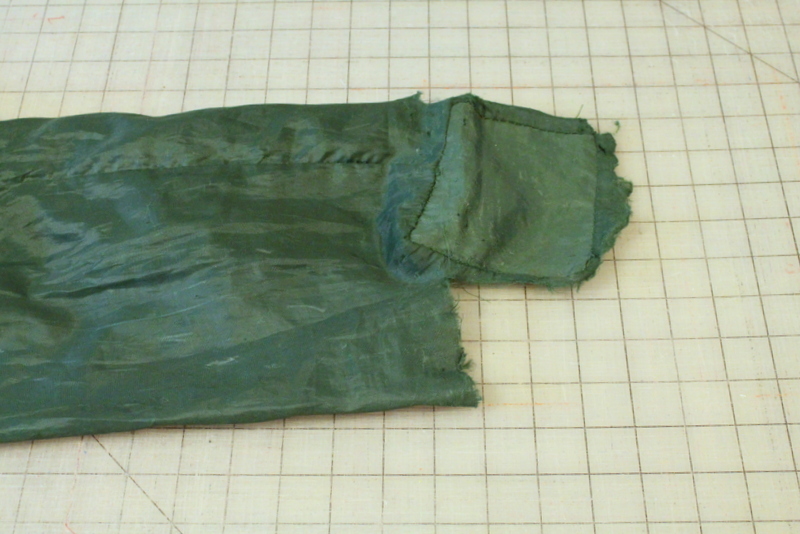 I tried repairing the bottom by sewing and serging the seams, but even that didn’t last long. My readers know that poor quality on manufactured goods is a major pet peeve of mine. I don’t understand why a bag like this would be constructed with a square panel on the bottom. Oh, and another thing….these bags are never big enough. We are always struggling to fit the chair inside. We had enough already! So, in about ten minutes, I whipped up a bag. cording and cord stop – salvage the old ones! 2. Remove the webbing strap and cording. I simply cut it off. I also removed the cording and cord stop. 3. Determine the dimensions required and cut the fabric. I laid out my bag on the cutting table. It measured approximately 37″ long by 10″ high. 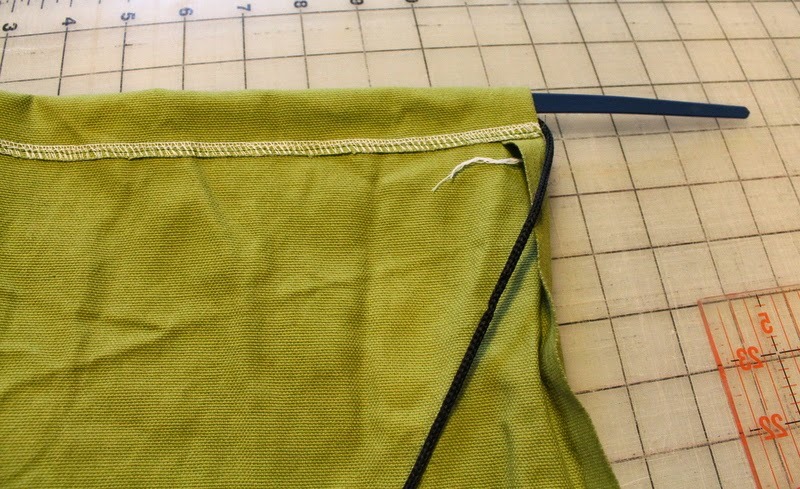 I then added 4″ to the length to account for the bottom piece plus an 1″ for the hem. I also wanted some extra room in the width, so I added 2″. If you don’t have an existing bag, measure the height of the chair and add about 6 inches to the length. Then, measure around the chair, add 2-3″ and divide in half. I used some stash duck cloth. 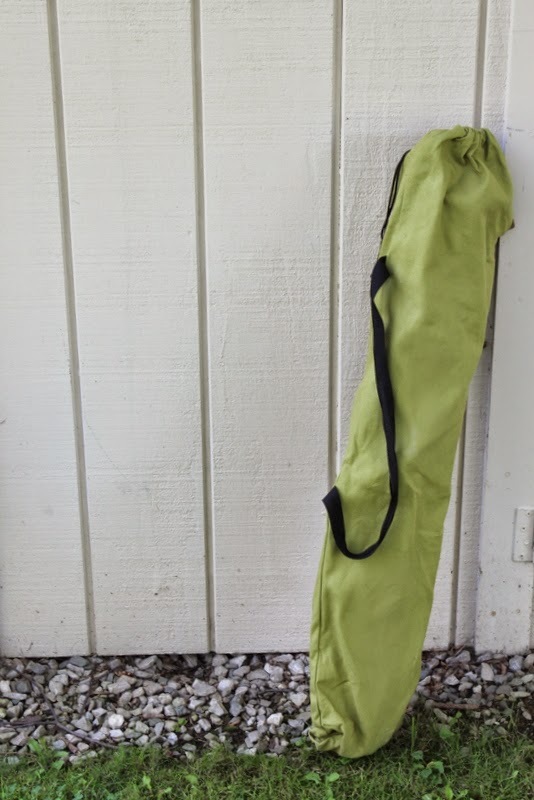 I love duck cloth because it’s sturdy, washable, comes in great colors and is 59″ wide. I laid out my fabric with the fold on the right. 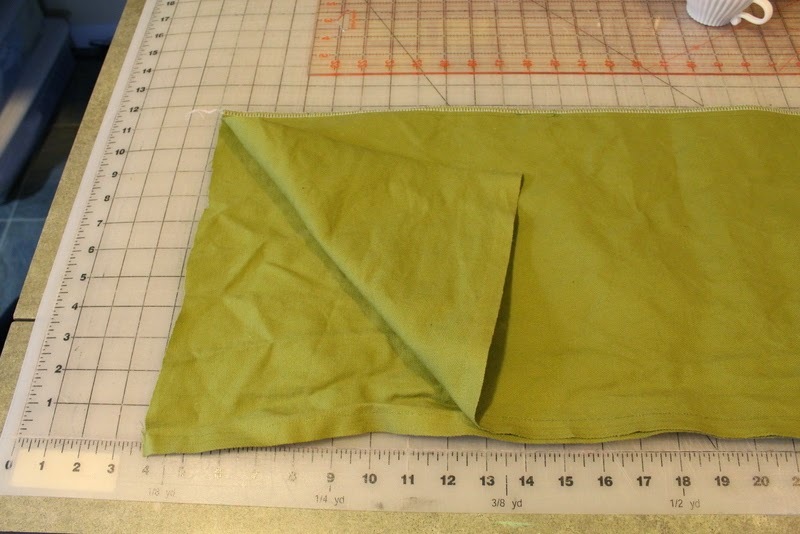 Based on my calculations, I cut the bag 42″ x 12″ with one end folded. The side closest to me on the cutting table is the selvage. Normally I remove the selvage before my sewing projects. In this case, I left it to save time on finishing. 4. Pin the webbing. 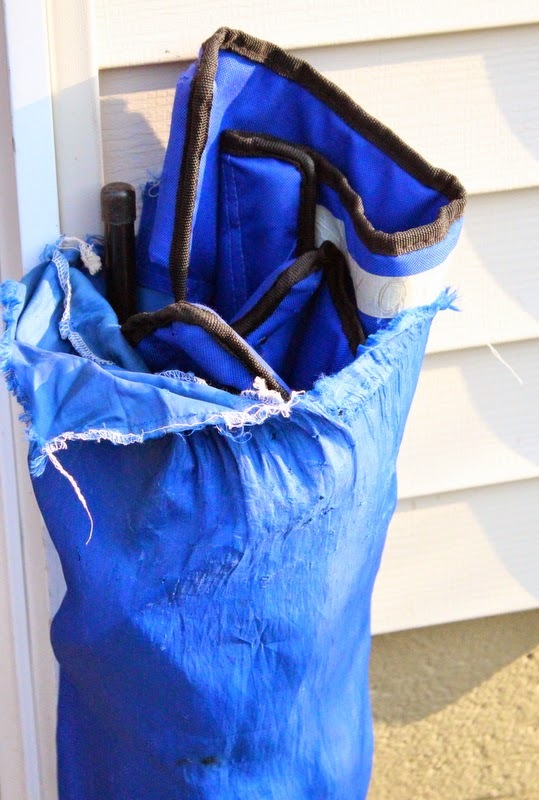 I pinned the webbing to the right side of the bag about 9″ and 25″ from the cut end. 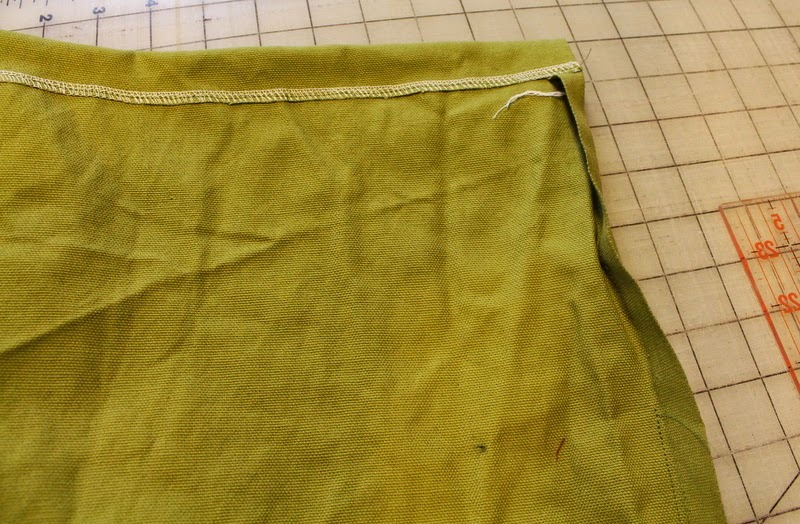 Sew the selvage side of the bag, beginning about 12″ below the top. There is no need to finish the seam. Press selvage seam open. I did not bother to create a boxed bottom. I simply sewed the two side seams. 6. Create a casing. Serge the top edge of the fabric. Fold down the top about 1″ and press. 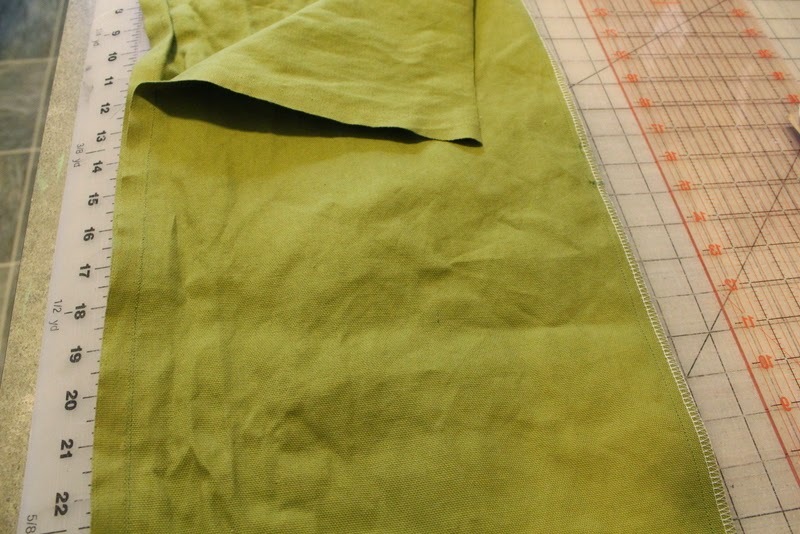 If you don’t have a serger, you can fold under the raw edge and press. Stitch the casing down. 7. Thread the casing. Thread the cording into the casing. When you have both ends of the cord, thread them through the cord stop. We are so happy with our new chair bag! 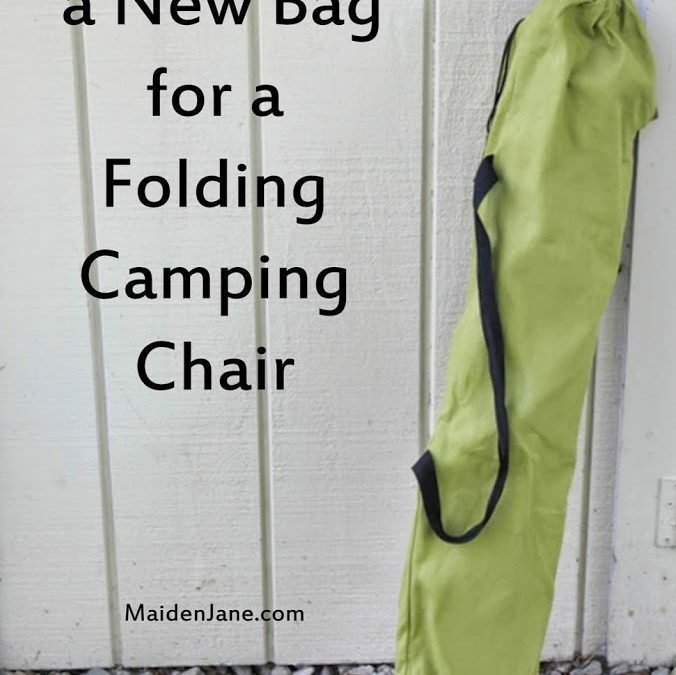 It’s sturdy and big enough to easily slide our chair into! Practical and way better than the original! Great idea! All of our bags have broken and we are left carrying the chairs without a bag. I need to whip up a few bags before our camping trip in 3 days. Thank you for sharing! 🙂 Happy Sewing! Thank you for these instructions. They were easy to follow, and now I have a snazzy new bag for my chair. 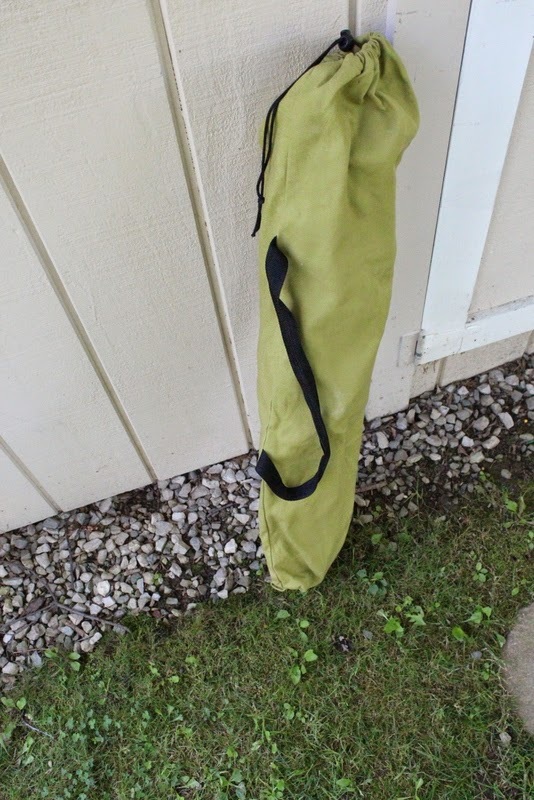 I used Sunbrella fabric. Thanks, Kate! Do you have a photo or a link to your project? I’d love to see it! Do you make these for others??? Hi Jen. Yes, I do! This is a lot of extra material just to get out of finishing one seam. 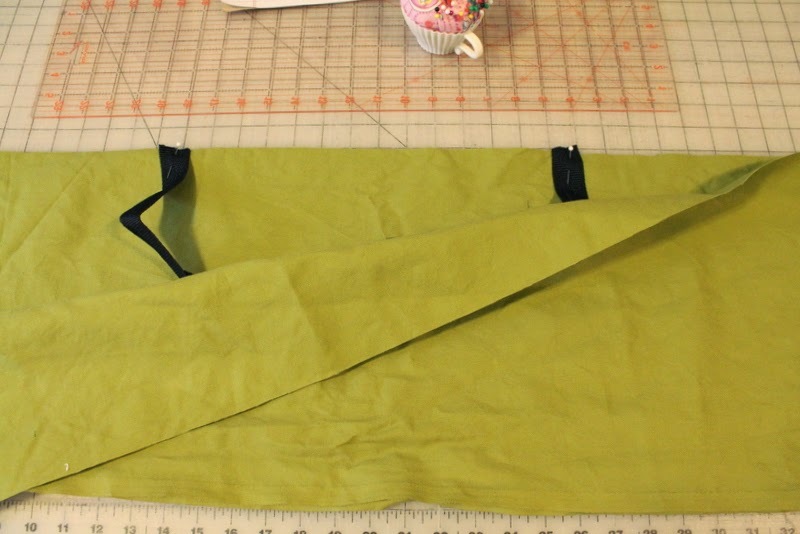 With 2 1/3 yards, you can make two bags as described, plus two more finishing both side seams! Otherwise, this is a great tutorial and any easy project. The extra material isn’t to get out of finishing the seam. I prefer not to have a seam at the point supporting the weight of the chair. 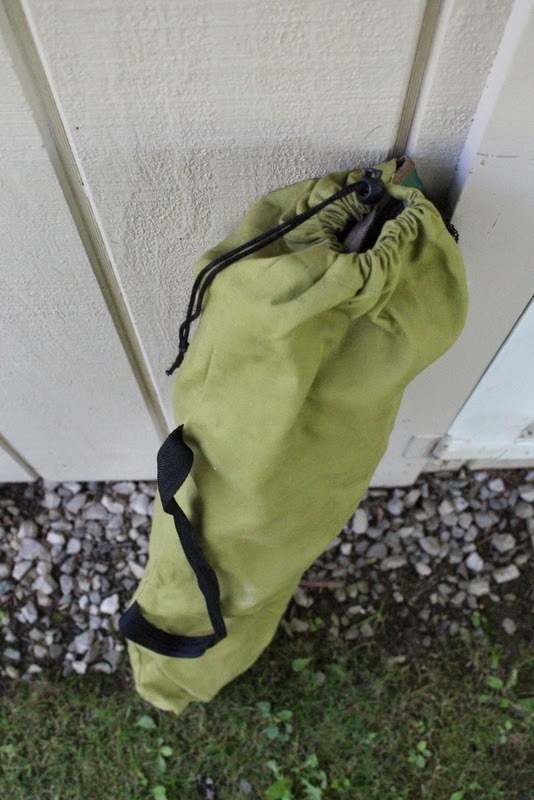 You can certainly use less fabric and use a seam in the bag and reinforce it for extra strength. 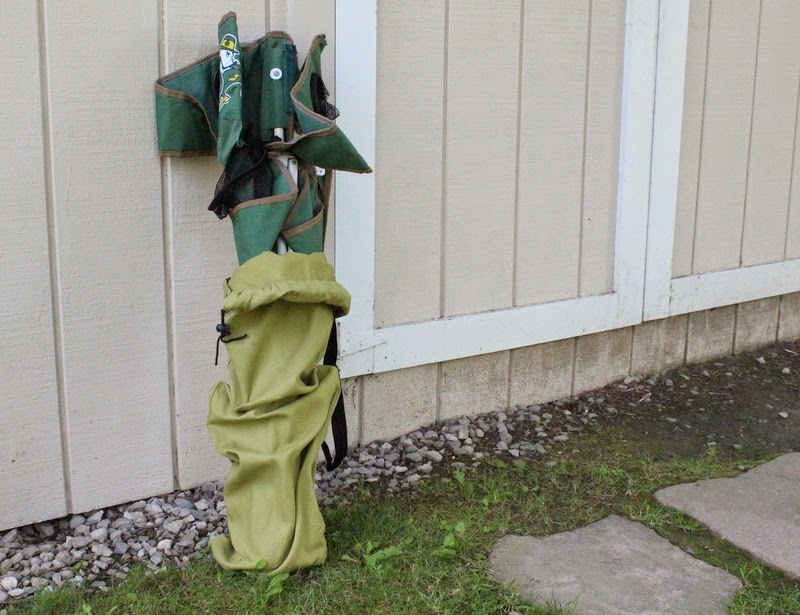 As described here and using 54″ duck cloth, you could actually get 4 bags out of 2 1/3 yards.